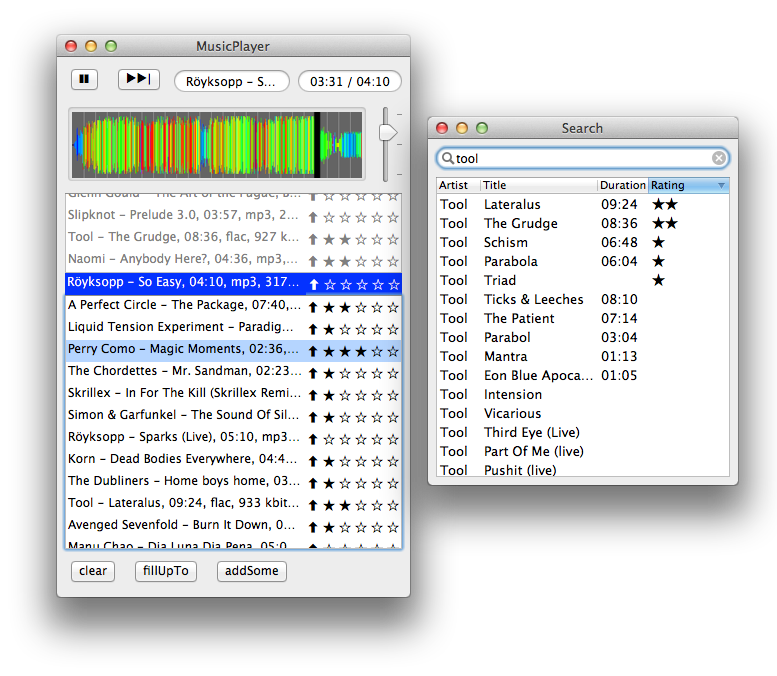 Download latest MusicPlayer for MacOSX. Doesn't work? I really want to help you to make it work, so please write me a mail to albzey@gmail.com. If you are on MacOSX 10.6, you can also try this download which was tested to support MacOSX 10.6. Read here about MacOSX 10.6 compatibility. There are no binary packages for older MacOSX versions but you might be able to compile it yourself. This music player is supposed to be simple and all centered around an infinite intelligent queue (some other players call this PartyShuffle or DJ mode). You can manually add songs to it - but if you don't or the queue gets too short, it will automatically intelligently fill it with further songs. The code is highly modular. Most systems are optional. Also the GUI is an optional module. The music player can also run headless. Read more about technical internals. The current GUI is Cocoa only. Additional Qt support is planned. The music player also works without any GUI.